Efforts are certainly in place to deter these kinds of activities, but only so much can be done on law enforcement’s behalf. Arizona has a strong prescription-monitoring program in effect to keep a watchful eye on physician-prescribing and pharmacy-dispensing practices. Nevertheless, doctors have the job of discerning which of the individuals they see and treat every day really need strong medications, like OxyContin and Adderall, and which do not. America has done a fantastic job over the years of painting alcohol as a safe and legal beverage that can help you relax, have more fun, and enjoy your life. 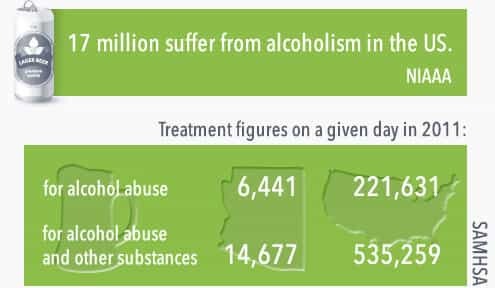 Unfortunately, the United States is also home to a great number of people who are suffering from alcoholism – 17 million to be exact.9 On a given day in 2011, 6,441 people were in treatment in Arizona for the abuse of alcohol alone, while another 14,677 individuals were in treatment for alcohol abuse in tandem with abuse of other substances.10 Nationally, those figures were 221,631 and 535,259. Often, people don’t take alcohol abuse as seriously as drug abuse. They assume an addiction to one is not the same as the other, but both produce a noticeable tolerance, cause individuals distress in their lives, and impact their health, emotional stability, ability to hold steady employment, and ability to maintain healthy relationships. If you’re fortunate enough to escape an early demise due to alcohol, you still run the risk of serious charges and jail time by using it in the wrong ways. In 2013, 31,662 people were arrested for driving under the influence in Arizona, and many of them in Chandler.15 Across the country, 1.4 million were arrested for the same crime in 2010.16 These individuals run the risk of hurting themselves or someone else every time they engage in drunk driving practices, and these are just the figures for those who get caught. Mental illness often compounds the issues substance abuse can cause. Many times, individuals who are plagued by both problems find that their overlapping symptoms are difficult to separate from each another, and they may very be engaging in drug and alcohol abuse as a means of self-medicating their feelings. 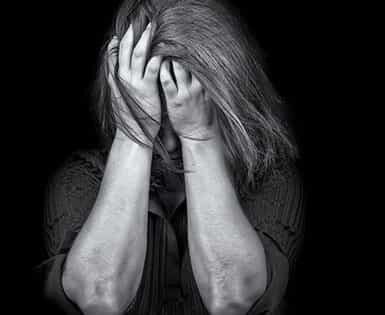 For instance, anxiety is an uncomfortable and frequently debilitating mental health ailment that affects about one in four adults in America every year.18 It can cause attacks to the nervous system and inflict the sufferer with trouble breathing, numbness in the face and limbs, paranoid feelings that they are in danger of being harmed, and blackouts. Likewise, substance abuse can also cause anxiety to form. When both issues are present, it can be hard to discern which came first. If you have found yourself struggling with anxiety or panic attacks, bouts of depression, turbulent mood swings, and other emotional issues, and reaching for prescription drugs, marijuana, or alcohol, you aren’t alone. Around 294,000 people are living with mental health disorders across the state of Arizona.20 Of the 11,813 people who died in Arizona in 2006, 979 of their deaths were attributed to suicide.21,22 It’s important to get professional help to ensure your ongoing health and stability. Taking advantage of therapies like CBT and MI can aid in curbing substance abuse issues, and these rehab models can also help to effectively repair relationships damaged by years of substance abuse or poor behavior. Family therapy can intervene in these circumstances, too, and assist in helping loved ones to better understand what it is their relative or friend has been going through and how they can support positive change for that person. For more information on options in Chandler, reach out to the Chandler Coalition on Youth Substance Abuse or the Division of Behavioral Health Services at the Arizona Department of Health Services. “State and County QuickFacts.” (2014). United States Census Bureau. Accessed September 20, 2015. “Drugs in the United States: Arizona.” (n.d.). NC Buy. Accessed September 20, 2015. “Arizona Department of Corrections Two-Year Prison Population Trend Report.” (Aug 2014). Arizona Department of Corrections. Accessed September 20, 2015. “Arizona Marijuana Laws.” (n.d.). FindLaw. Accessed September 20, 2015. Radnovich, C. (2013 Jan 21). “Report: Arizona has nation’s sixth-highest prescription drug abuse rate.” ABC News. Accessed September 20, 2015. “Alcohol Use Disorder.” (n.d.). National Institute on Alcohol Abuse and Alcoholism. Accessed September 20, 2015. “2011 State Profile — Arizona.” (2011). Substance Abuse and Mental Health Services Administration.Accessed September 20, 2015. “States in Brief: Arizona.” (n.d.). Substance Abuse and Mental Health Services Administration. Accessed September 15, 2015. Hellmich, N. (2013 Sep 16). “1 in 10 high school seniors are extreme binge drinking.” USA Today. Accessed September 20, 2015. “Alcohol-related deaths: How does your state rank?.” (2014 Jun 27). CBS News. Accessed September 20, 2015. Ferdman, R.A. (2014 Jun 27). “Where binge drinking id deadliest in the U.S.” Washington Post. Accessed September 20, 2015. “State Map.” (n.d.). Foundation for Advancing Alcohol Responsibility. Accessed September 20, 2015. Chambers, M., Liu, M. & Moore, C. (n.d.). “Drunk Driving by the Numbers.” Bureau of Transportation Statistics. Accessed September 20, 2015. “Arizona Drunk Driving Fines & Penalties.” (n.d.). NOLO. Accessed September 20, 2015. “NAMI’s New Fact Sheets on the Uninsured and the Costs of Mental Illness.” (Aug/Sep 2007). National Alliance on Mental Illness. Accessed September 20, 2015. “Substance Abuse Treatment for Persons with Co-occurring Disorders.” (n.d.). Treatment Improvement Protocol. Accessed September 20, 2015. “State Statistics: Arizona.” (2010). National Alliance on Mental Illness. Accessed September 20, 2015. “Deaths by state of residence distributed according to state or country of birth, by age: United States, 2006.” (2006). Centers for Disease Control and Prevention. Accessed September 20, 2015. “Substance Abuse Treatment Facility Locator.” (n.d.). Substance Abuse and Mental Health Services Administration. Accessed September 20, 2015. “Sober Living Directory.” (n.d.). Intervention America. Accessed September 20, 2015. “Substance Abuse & Mental Health.” (n.d.). Helpguide. Accessed September 20, 2015.